This is my seventh season working in the RSE scheme. I have worked for Pick Hawke’s Bay (PHB) for six seasons and one season for Bostock. In 2011, I was recruited by Bostock. I was really happy because this was my opportunity to earn money for myself and also to help my family. Before this opportunity we struggled to build a house and to help out my sister’s daughter for school. I heard about recruitment from my Aunty Cathy. She told me Bostock was looking for some workers to come to New Zealand to work. The recruitment was held at the children’s park in Honiara. There were not many people at the park, just a few of us. Only 15 of us were recruited on that day to work for Bostock. The recruitment for PHB was also at the Children’s Park in Honiara. Aunty Cathy called out all the names and my name was on the list. She told me that she was picking names for those to come and work for PHB and she asked me if I would like to go there and I said yes. My first season with PHB was when Anthony started as the General Manager, so I have been with PHB the same time as him. When I worked for Bostock we didn’t have any hard rules like PHB. PHB has strict rules and for me, it is good because we come here to earn money. The strict rules help keep our money safe. I can see with other companies that don’t have strict rules, the workers lose their money or spend it all and don’t take any money home. I am used to the PHB rules. I explain to our boys about why PHB rules are strict because it keeps our money safe, safe from spending all our money. Going to work for the first time at Bostock, I really liked it and I wasn’t scared. I was told that I will be picking apples and that I will start on Monday. I wanted to go to the orchard and see what apples looked like because we don’t have apples back at home. I wanted to know if it is a small fruit or a big fruit, so I asked my driver to drive me to the orchard to look for some apples. I was surprised to see what an apple looked like and I was like ‘oh, is this what an apple is’. I picked an apple from the tree and took a bite and that is when I knew that I was in New Zealand. I really liked the taste of apples, it’s very juicy. At Bostock, we would start work at 7.30am and finish at 4.30pm, this was not long enough for me, it was too short for me because I wanted to keep on working. I would keep on picking apples and the boss would tell me “Israel, it’s time to finish”. I really like apple picking, I enjoy it. I like the hard and physical work. At first, I was placed with the group that was training to pick apples, but I wanted to work with the returnees, the experienced workers who were faster. I knew I was able to pick as fast as them and that is why I wanted to be in their team. I was able to learn quickly how to do the work, I found it easy to do. It took me about two weeks to learn everything on the job and by then I was able to catch up to the experienced workers. The returnees would pick around 7 bins a day and I was able to pick the same amount of bins. My first time I would pick the right colour.In 2012, I was recruited to work for Pick Hawke’s Bay. I was happy to work for Pick Hawke’s Bay because when I worked for Bostock, I was only working for three months. With Pick Hawke’s Bay, I can work longer during the season. I can make good money. Coming to New Zealand for the first time was also my first time on a plane. I remember being at Honiara airport feeling sad but also very happy and excited. I was sad to leave my family and my mum. Being on a plane for the first time I felt ok. When I arrived in New Zealand it really felt like I was in a different country. Everything looked so different and there are many different kinds of people. In the Solomon Islands we only have Solomon people, Polynesians and some Chinese. Coming to NZ has given me new experiences and taught me a lot. I really enjoy the Western way of life. Coming here to work makes me feel like I am a part of the Western life. When I am not working I like to tour around and look at different places here and then I can tell my family the places I have been to. My family are surprised to hear my stories. People are really kind and friendly here, when I walk around town people talk to me. They always like to sit with me and ask questions because of the colour of my skin. The people in New Zealand are kind to me because of the colour of my skin. 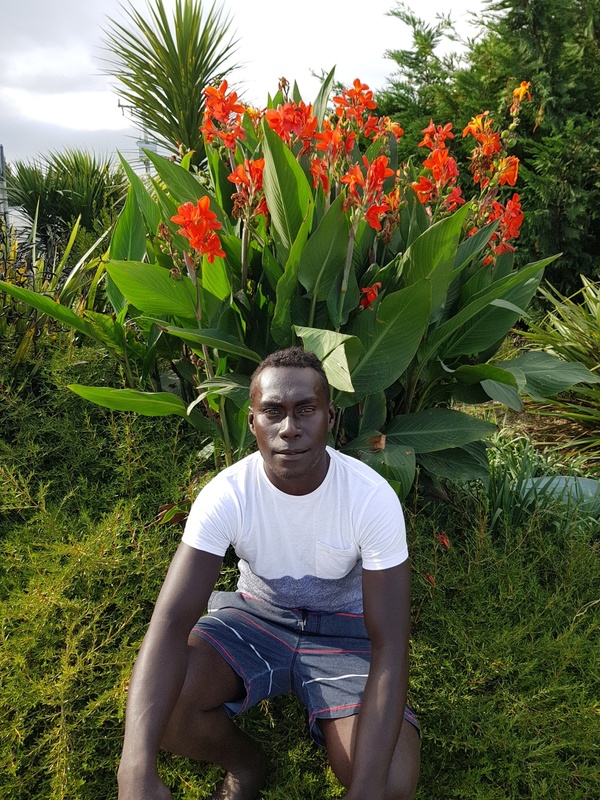 They ask if I am from Africa and I tell them “No, I am from the Solomon Islands”. Sometimes they ask if they can take me back to their home to be their friend and I tell them, “No, because of our rules”. One time a boy was crying for me and asking his mum if I can go home with them, he was about seven years old, this was at the Warehouse. He just come and take my hand and take me to his Dad, so I walk around the Warehouse with them and just talk and they ask questions about me. Coming here to work means I can help my mum and support my sister. For my mum, I built her a house in 2013 and completed the build in 2014. It didn’t take me long to build her house because I already had copra and the timber was free. The timber was free because I cut the trees down myself and also cut it into timber, this is what I used to do before RSE. I didn’t need to spend much on the house, all I had to buy was the glass for the windows and a few other things. I got a some of boys to help me build and in return for their help, I would give them food and drink. Some of the boys would ask me to buy them a phone or speakers for their labour, so when I come back to NZ I would buy it for them. After I completed my mum’s house, I built my own house in Panatina, Honiara. My brother looks after my house when I come here to work. My house has an upstairs flat that I put up for rent. My cousin rents the flat. The upstairs is complete but I still have to finish downstairs where I live. All I have to do is lay the brick. January of this season was good for earning money, so now I have the money to finish my house. I have a taxi business back at home that keeps me busy when I return. I’ve had my taxi for about six months. I also help out my sister with her daughter’s school fees. The school fees are expensive, about $1800 Solomon dollars for one year. My future plan is to buy another taxi and I will hire someone to drive this taxi. The taxi business makes good money. Back in my province, Choiseul, I bought a generator, grass cutter and keyboard for my church and I also bought a solar panel for my aunty. All of these things were purchased here and then put in the container to send back home. We earn good money here so we have to help each other back at home. I know that the people that I have helped will one day help me as well. To me, the RSE scheme is my opportunity. I try not to let anything destroy this opportunity that I have. I have been working here for seven seasons so I have a lot of experience. I already know how to do a lot of the work. This is my only job and the only place I can come to make good money. We are happy with the RSE scheme. We all come here to help the farmers and growers and they also help us too. This season will fund my second taxi, I look forward to this. I just try my best and look forward to this year. I like to be here because it’s an opportunity. I like being here in New Zealand.